You can see the size of these works, but the video does not show their unique composition qualities. The photographs are not simply an enlarged print of a single photograph. Each one is a composition of between 100 and 150 separate photos taken in a grid-like manner and then digitally stitched together in a computer lab. The product is a file made up of literally billions of pixels. The 100-150 individual shots are all taken with the same focus and metering, based on the initial photograph of the “subject,” the animal nearly hidden in an otherwise seemingly dense array of patterns and blended colors. The effect from a distance is like a field of vision when one “spots” an interesting animal, with the rest of the surroundings not immediately a mater of attention. But because this moment is frozen, it’s possible to see the many details that would otherwise go unnoticed by our concentration on the subject. While I was at the gallery yesterday, by chance I met Ghislain David de Lossy, a charming man who graciously took time to explain the technique he and his wife employed in these works. Led to likely locations by a guide, they would set up blinds several miles apart to await the arrival of the “game.” If a subject arrived, they would await until the animal accustomed itself to the structure which was new to its environment. Once the subject assumed a desired pose, it was photographed in sharp focus at an appropriate metering. The photographer then proceeded to swivel the camera on its mount to take the framing photographs one by one in a grid-like fashion, all the while attempting to maintain a perfect horizontal so that the individual photos could be sewn together in the lab. Mr. David de Lossy said that often this proved difficult, especially when the camera mount was set on permafrost, which sometimes slightly gave way and subtly affected the horizontal of the tripod. In those cases the grid-like pattern for the 100-150 photographs could not be maintained and when the efforts were reviewed in the lab, sometimes large segments of the total landscape was missing and the effort was for naught. In addition to the intense concentration required over long periods simply to locate the subject, the incredibly precise clarity of the portraits required state of the art equipment. The artists told Ragzine.cc that they used a 600 mm :4 super telephoto lens (at full aperture) on a 24 mpx Nikon D3X. The result is the effect of looking out of a very large picture window into a European forest or tundra. All of this is of course background to the real interest of the works. The idea that animates all them is a sense that the natural world has hidden features that escape our notice. This is expressly demonstrated by portraying a subject that is often barely noticeable except for careful study of the large work. Natural camouflage, dense vegetation or a combination often make animals invisible in the wild. Finding the animal in these works is often the first task. Once the animal is located, one can’t help but marvel at how it remains hidden in the open. But once one discovers the “subject,” its possible to see it simply as an element of a larger composition. I’ll have to make use of a rendering of one or two of these works, just so you can see what I am talking about. Bear in mind, however, that a reproduction here cannot begin to show the incredible detail of prints. All they can show is how relatively small the animal subject is to the entire landscape. It is a little ironic that a digital photograph is really not best seen on a personal computer (because the screen is not large enough). I’ll give you a link at the end to the de Lossy website which allows for zooming in on several works. Even that, however, is not nearly the same as being able to walk up and see the images a point blank range. Perhaps this shows that even digital technology cannot dispense with tangible works themselves. Sisso (Montgai, Spain. 2012) is panoramic landscape of a meadow under a light blue sky. The subject is called in English a Little Bustard (Tetrax tetrax) and is a breeding male in full dramatic neck plumage. Sisso by Ghislain and Marie David de Lossy (2012). Another example I’ll show is Palokärki (Korouoma, Finland. 2011), the subject of which is what is called the Black Woodpeck in English (Dryocopus martius). Palokärki by Ghislain and Marie David de Lossy (2011). Ghislain and Marie David de Lossy appear to have come upon this genre relatively recently. Their career seems to have largely involved (human) portraiture, and they have worked for both Corbis and Getty (and still do). (This probably accounts for the decision to focus on a single subject in the landscape.) Mr. David de Lossy tells me, however, that he has had a lifetime of birding experience in Europe behind him and that when he turned to this type of nature photography he was motivated by two considerations: to add some creative technique to the genre and to avoid doing easy shots. These considerations undoubtedly formed the basis of an unstated aesthetic. In this regard I can’t help but compare a photo from the show with an acknowledged European masterpiece. 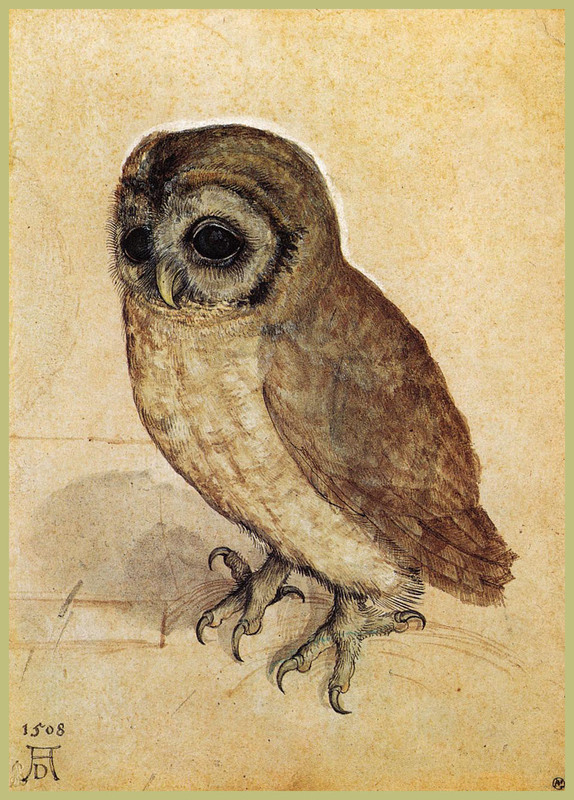 The Little Owl by Albrecht Dürer (Watercolor on paper. 1506. Albertina, Vienna, Austria.) Click to enlarge. I don’t have a file of the photo and it is not on the de Lossy website (although another shot of the same kind of bird is found here), so you will have to take my description (or better yet see the show) of Mochuelo M (Bellmunt d’Urgell, Spain, 2013). The subject is the Little Owl (Athene noctua). The landscape is a rocky outcrop surrounded by new growth of various grasses. The spotted brown owl looks out from behind the grass, with one eye in full view, its right eye just barely. The little bird is perfectly secure in its environ. Of course, when the most famous rendering of this bird was done by Albrecht Dürer more than 600 years ago, the purpose was entirely different. Dürer’s version illustrates the time (and technique of the times) perfectly. The bird is examined in artificial surroundings, but the wild nature is emphasized by the talons, which clearly show its predatory nature. The bird looks down, almost as if in a sullen mood (perhaps for being out of its element). Dürer renders the portrait with intricate brushstrokes to simulate the texture of the feathers. It is a perfect representation of the Renaissance urge to examine nature as “types,” to separate it from the whole and to catalog it. The aesthetic of this show (and perhaps our time), however, is quite the opposite. The animals are not highlighted (except by focus). They are seen in situ, despite how difficult that makes it for the artist and the viewer. It no longer is something for our edification, but rather for our wonder. Our job is not to classify and learn but to marvel. The show is on view until February 1 and the prints are listed for sale. If you are in the city it is well worth your effort to see for yourself. Those unable can view a considerable number of the photos at the de Lossy “Not Alone” website. But I have to warn you that while it gives a sense of the prints, only physical inspection will do. It’s really hard to describe with words what these pictures are about. This article did it. Well done DK Fennell! Wonderful, engrossing images! Great description. Thanks.